Happy International Glamping Weekend! June 1-2 (yes, I’m a little late) is International Glamping Weekend! I read about it in my book my boss bought for me when he was camping in Utah! A book review will soon follow! Who knew? I went glamping last weekend, and it was International Glamping Weekend! Thank you for alerting me. Ditto here! We were camping this past weekend, and were as glamped out as we could be! Unfortunately for my partner (a man who winces at the thought of taking a heater…pfft! 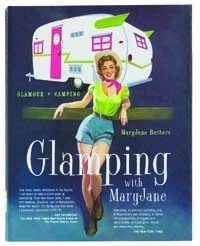 )… you just cannot take the ‘glam’ out of the ‘glamper’… so glad to see this and know that my glamping is very normal!!! I will need to share this with my folks who have endeavoured to change my ways… love camping and equally love the new kitted out glamper trailer… always packed and always ready to go at a moments notice!! !